It comes as no surprise that during the warmer months, we shift our attention to the outdoors. Outdoor space design today means more than a couple of lawn chairs and an umbrella. Outdoor TVs and advanced sound systems that can withstand rain and changing weather are just a few recent innovations. However, as we spend more money on these outdoor investments, it becomes increasingly important to design our spaces right. By following these tips, you'll be just a step away from the outdoor space of your dreams. Adding personal touches will help claim an outside space as an extension to your home, and defining the space will truly make it a room. The biggest mistake homeowners make is ignoring the actual size of their backyard. A lavish back area demands a complex solution in terms of a large lounge and kitchen area, a green area, and possibly water features. A smaller backyard will still benefit from a cleverly designed patio, but you need to make certain compromises to make the space the best it can be. The Residential Landscape Architecture Trends survey conducted by the American Society of Landscape Architects defined kitchens and entertainment spaces as the most popular outdoor "rooms." These spaced received a 94.5 per cent rating, quickly followed by gardens and landscaped spaces, with 94.4 per cent. More than three-quarters of home owners favour outdoor recreation amenities such as pools, spas, and tennis courts. Before you start creating your outdoor room, think about the way you and your family will use the space. If you enjoy throwing big parties and love friendly gatherings and afternoons talks over coffee, a large deck with plenty of seating and a bar would be the perfect option. On the other hand, if you prefer sports and entertainment with the kids, make sure to place a trampoline, a ping-pong table, or even a swimming pool in your backyard. A grill area and an outdoor dining room will surely contribute to a more intimate atmosphere. Think of outdoor rooms as a natural extension to your house. Indoor and outdoor rooms usually connect to your house with a glass sliding door or large French window, and designing both rooms in the same style will harmonize your home’s landscape. Your outdoor lounge will then optically become a part of your living room and look more inviting. Before you start designing, play around a little with the orientation of your patio. Your outdoor living room should be accessible from the house. The space could become a natural transition from your living room, or you could situate it near your kitchen door so that you don't need to go far to prepare some food. Make sure that you have easy access to water and power. 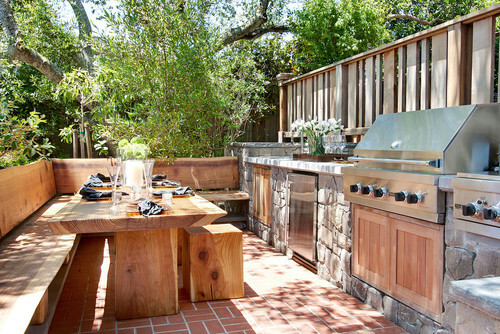 An outdoor kitchen without running water and electricity is tricky. You'll relax more on your patio if it offers a good view. If your home is near a body of water, make sure you can overlook the scenery from your patio space. This way, your outdoor living room will be a great place to lounge and entertain your guests. One last thing to keep in mind is natural elements such as prevailing winds and sun orientation. Examine the area where you plan to locate your patio, and make sure your outdoor room won't be too hot — especially during peak times when you would usually use the space. 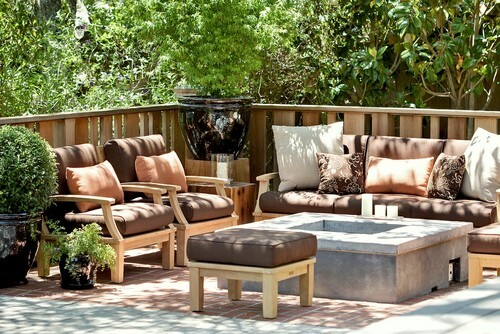 Furnishing an outdoor living room is easier in many ways than setting up the indoor room. Sofas and sun beds are the centrepieces of a lounge — so much so that 96.3 per cent of participants in the ASLA survey couldn't imagine their outdoor room without them. Since outdoor furnishings sit outside the whole year round, they should be weather-resistant yet good-looking and comfortable. Rattan wicker and similar materials are popular choices. Choose the colours you like that complement your indoor furnishings. If your furniture is black, use pastel colours for cushions. Make sure also to choose sizes appropriate for your space. Lower oversize chairs and sofas with low but large coffee tables are great for putting your feet up and taking a snooze, and they also work great when you’re rounding people up at night for family-style dining or beverages. To get the most out of your outdoor entertainment area, consider placing umbrellas, gazebos, awnings, or pergolas where you place your furnishings and where you expect you and your guests will stay most of the time. Later, when a shower or rain comes, you won’t have to move inside. Just because the room is located outside, doesn’t mean it can no longer offer some privacy. A fence or tall plants can help you solve two problems are once: ensuring privacy and shelter from inclement weather. Other options include screens and decorative stones placed on top of each other. Outdoor heaters can significantly extend your outdoor room use. They are popular among 50.6 per cent of homeowners. A wide variety of heaters at different price levels is available. Tabletop gas heaters start at $250 per heater, while free-standing, permanent or portable models cost approximately $1,000. 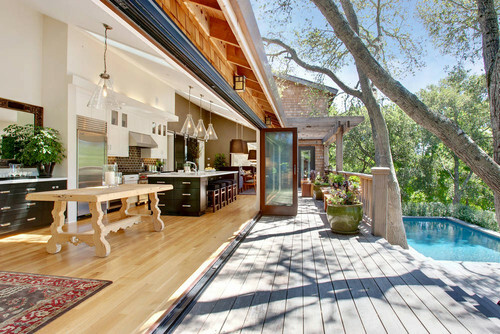 The outdoor kitchen should be part of your lounge area. Meal preparation takes time, and separating the chef from the rest of the party won’t help the meal quality or the entertainment. 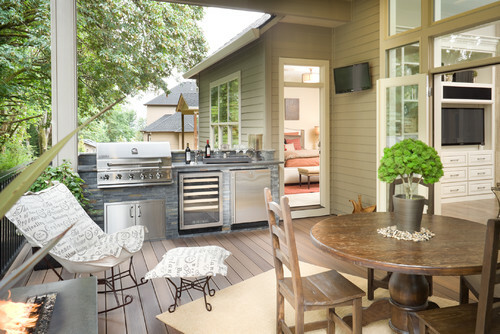 Alfresco kitchens usually comprise a range, grill, drawers, and refrigerator in one unit. These are the essentials, but if you're up for more complex cooking, you can add more features. You'll notice that these kitchens usually include a complete set of these utilities in just one area so that it occupies a small portion of the yard. Smaller entertainment areas that can’t accommodate a full outdoor kitchen can benefit from a fire pit or fireplace. Outdoor TVs and stereo systems are the next big thing in outdoor room design. Music has a great impact on the way we feel, and it contributes to the overall ambiance of a space. Outdoor speakers are water-, dust-, and heat-resistant, so you can install them permanently outside. Basic outdoor speakers are available from $200; however, if you're looking for a complex sound system, be prepared to spend ten times more than that on average. Outdoor TVs are less common, mainly because of the price. The average price for a 32” outdoor TV is $2,000. Increasing diameter plunges the price up, so if you dream about a 65” TV, have approximately $6,000 ready. A home surrounded by a beautiful garden seems like a dream come true, but before you raise a shovel, you need to consider the impact of the plants to home systems like water pipes, gutters, roofing materials, and air conditioning units. 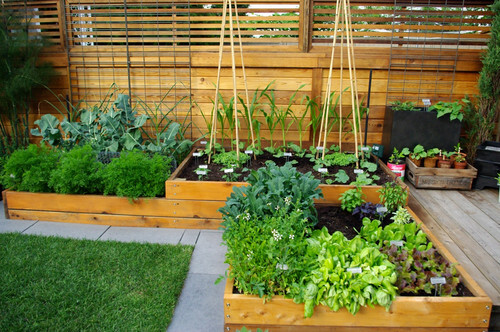 Take maintenance into consideration as well, as gardening will definitely consume many hours. Also, bear in mind that not every site is suitable for growing plants. Try to determine how much sunlight flowers and plants can get, because this should determine which varieties you choose to plant. You should take note of the most shadowy and most sunlit areas. This is very important because you wouldn’t want to see your chosen plants wither just because they couldn’t tolerate the garden's sunlight or shade. Properly chosen greens can help. If noise from passing vehicles bothers you, you can make use of hedges to mute the sounds of the traffic. Your children can benefit from a designated play area where they can build castles or play hide and seek. 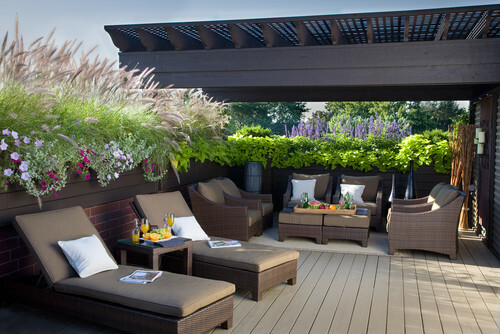 You can also allocate space for an outdoor room or incorporate some plants in the design. You don't need to limit your green area only to the ground. Use different pots, jars, urns, decorative stones, and lighting — just be sure to choose the right piece that won't overcrowd your area. A great way to incorporate different elements in your landscape design is to use anchor plants. You can plant several shrubs that create a sense of unity in your design. Low-maintenance landscapes were voted the number one garden element by 94 per cent of home owners. The number of food enthusiasts is growing each year. Freshly picked vegetables will taste great in homemade salads! Asian vegetables — like pac choi or bok choy (ching chiang), gai lan (midwater), and Mizuna — beans, beets, broccoli, cauliflower, carrots, kale, lettuce, leek, parsnips, and radishes are among the easy-to-maintain vegetables that grow naturally in BC. The UBC Botanica Garden and Centre for Plant Research offers great help to beginner gardeners. Your water feature can surely add beauty to your landscaping. Featuring water elements around the house can evoke a different feeling. It gives a more relaxing ambiance with the soothing sound of running water. There's a wide variety of water features to choose from. 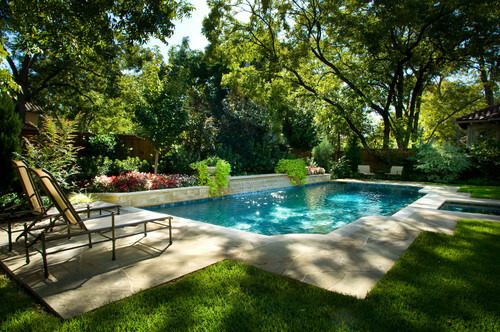 The ASLA survey identified decorative water elements like ornamental pools, splash pools, waterfalls, grottos, water runnels, and bubblers as the best-loved options. As many as 91 per cent of respondents voted for one of these choices as an outdoor space must-have. 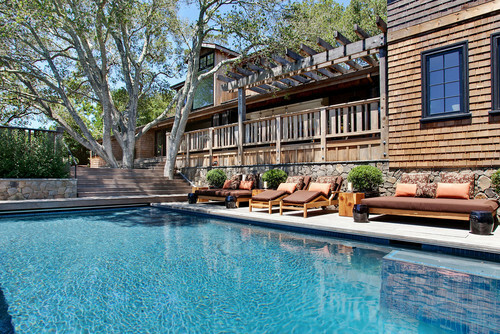 Swimming pools are more popular in southern, warmer climates, and they received only three-quarters of the votes. Before you head to a home improvement store, check your available space. Understanding the area you have to work with will help you determine what type of water feature suits your yard best. Water features come in different sizes, which means you won't be able to get that big fountain if your space is limited. 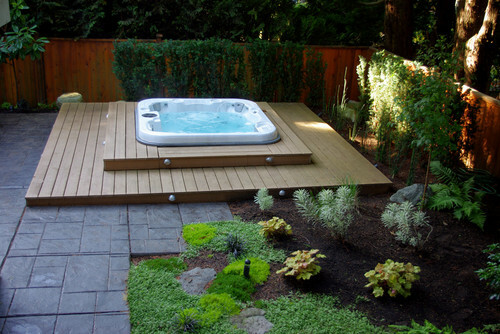 Make sure that even after you install your water element, you still have enough space to move around your garden. If you worry about mosquitoes, consider installing a fish pond, as fish will eat them. It's a good idea to consult your local government, as they may require you to get a permit for the water feature you're about to build. This is especially important if plumbing work is necessary. This entry was posted in Vancouver Blog on June 23, 2013 .